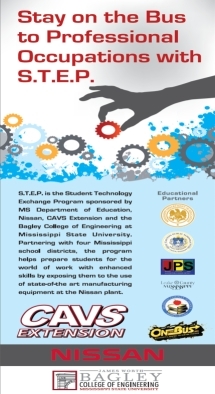 The Student Technology Exchange Program (S.T.E.P.) will effectively engage students in the science, technology, engineering, mathematics (STEM) by embracing their existing knowledge, mind set and skills and building a bridge to the world of work through a manufacturing, design and engineering approach that engages real job activities with a current manufacturer. This approach will focus on the skills required as a professional engineer, industrial maintenance technician, designer and manufacturing engineer. The bottom line is to help these students identify where they are and where they could be in these technological fields with a professional job. These students will come in contact with equipment and people that could help them visualize their own future in the world of work. S.T.E.P. actively engages the instructor as well as the students in these technological areas: robotics, programmable logic controller, computer simulation software and computer aided design software. S.T.E.P. actively engages the students in these engineering concepts: the principals of digital electronics, kinematics, physics, and software engineering design. S.T.E.P. actively engages the student in these science concepts: the laws of motion, theory of relativity and physics. S.T.E.P. actively engages the students in these mathematics concepts: distance, relationships, degrees of freedom, rules and constraints. S.T.E.P. actively engages the students in these team activities: pre-admission college, manufacturing tours, graduation ceremony and program competition. Student & Instructor Training: This component is the major element in the program where the students and instructors will be trained on these technologies: Robotics, Programmable Logic Controller (PLC) and wireless communications. Instructors will receive a 40 hour training class in robotics and 16 hour training class in PLC. This training is intense and given by an industry expert that will help mentor the instructors throughout the school year. Instructors will receive Continuing Educational Units (CEU) for their participation and completion of the training. Students will receive 54 – 80 hours of contact with the robotic and plc equipment in a computer simulation and live equipment. Manufacturing Tours: This component allows the student to see the world of education and work as they determine what is in store for their future. The tours will visit manufacturing and engineering educational facilities to get first hand information on the process, jobs and responsibilities. Pre-Admission College: This component will allow all students to pre-admission for college. This activity will have representatives from surrounding institutions to present to those students who want to attend and give them an opportunity to start the process to enrollment. Competition: This component will hold trials to determine the outstanding school and student in robotic/plc programming of a computer simulation and live equipment. Graduation Recognition: The graduation recognition will give school grants and Outstanding Student Scholarships to higher education institutions in that students name in Mississippi. 2018 STEP Graduation has been scheduled for April 19, 2018. Click here for details.